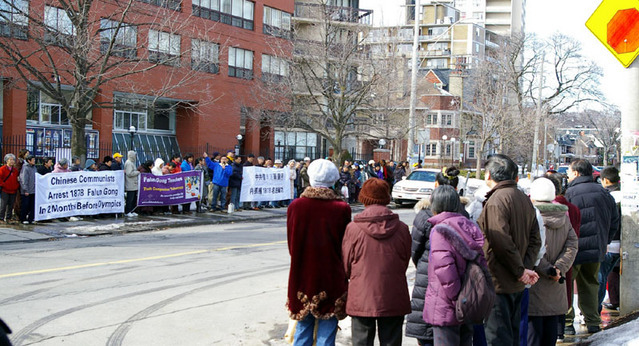 On March 15th, 2008, Falun Gong practitioners held a rally in front of the Chinese Consulate to Toronto to protest the Chinese Communist Party's (CCP) mass arrest of Falun Gong practitioners across China in the past two months. Falun Gong practitioner Ms. Sun, who immigrated to Canada from Shanghai, learned from a phone call to a practitioner in Shanghai two weeks ago that the plainclothes police from the Songjiang 610 Office came and knocked on his door. Through the peephole, he recognised that the person was from the 610 Office, so he did not open the door. The police stayed outside for two hours and then left. "He told me that another practitioner who he is familiar with opened the door when the plainclothes police knocked. The police then arrested that practitioner and took him away," Ms. Sun said. Ms. Sun told the reporter that the CCP arrests people on the excuse of hosting the Olympic Games. Shanghai is one of the places where the most arrests have taken place. They secretly arrested practitioners based on a blacklist. They took the arrested practitioners away from their homes without being noticed by the practitioners' neighbors. Ms. Sun continued that the CCP is very heinous. In addition to protesting, we must expose all the sinister deeds it has committed. "Today I come to the Chinese Consulate to protest the CCP arresting my fellow practitioners. Not only were practitioners I know arrested, but many more practitioners across China were also arrested. The CCP is most evil." According to the Falun Dafa Information Centre, from January 1st, 2008 until today, it is estimated that the CCP has arrested 1878 Falun Gong practitioners in the context of preparing for a "successful" Olympic Games. Nationwide, the arrests have involved 29 provinces, cities and autonomous regions across China, among which 156 cases were in Beijing. Senior citizen Ms. Guo told the reporter in tears, "They arrest Falun Gong practitioners,and suppress appellants in the context of preparing for a 'successful' Olympic Games. This should not be allowed. To host the Olympic Games, they should follow the Olympic spirit. Such a persecution is unpardonable by heavenly principles, so I must come to protest." Falun Gong practitioner Mr. Wang, who immigrated to Canada from Guangzhou, pointed out that Falun Gong practitioners have not broken any Chinese laws, so the CCP does not go through normal legal procedures in dealing with Falun Gong practitioners. "They attempt to deceive foreign journalists. By arresting those who the CCP is persecuting, the foreign journalists won't be able to find them," Mr. Wang said. He continued that "The CCP wants to present a false picture of peace and prosperity, but it can be seen that they are weak and fearful. The CCP has never changed its brutal nature, what keeps changing are their methods to deceive the world's people." Spokesperson for Falun Gong Joel Chipkar pointed out in his speech that the CCP's continuing brutal persecution of Falun Gong directly violates stipulations in the Olympic Charter. He said, "Today, we are here to demand an immediate release of all illegally detained Falun Gong practitioners. We also call on the international community to condemn the CCP's atrocities, and help stop the CCP's persecution of Falun Gong."